I spent the morning cleaning and thinking about James Baldwin. I’m reading Go Tell it on the Mountain, and it’s such a strange combination of instantly powerful and hauntingly beautiful. The scenes and sentences that stay in my head aren’t the ones I expect, the passages I find myself instantly re-reading and then reading again are not the most dramatic passages. They describe in-between times, times of working and waiting, and they’re so thoughtfully observed and beautifully expressed that they make the book human and honest and real, and make it something greater than that as well. And I spent the morning cleaning, as I spend most mornings cleaning, to try to fight the creeping dust and dirt and chaos. But you can’t tell that I’ve been cleaning, you could never tell, because I’m not very good at it and for whatever small part I clean, the rest of the house is conspiring to coat itself in dust and clutter all around me. And it does feel like a waste of time, sometimes, except that you can think about James Baldwin while you do it, and even think that he’s had the same feelings about it. To sweep the front room meant, principally to sweep the heavy red and green and purple Oriental-style carpet that had once been the room’s glory, but was now so faded that it was all one swimming pool of color, and so frayed in places that it tangled with the broom. John hated sweeping this carpet, for dust rose, clogging his nose and sticking to his sweaty skin, and he felt that should he sweep it forever, the clouds of dust would not diminish, the rug would not be clean. It became in his imagination his impossible, lifelong task, his hard trial, like that of a man he had read about somewhere whose curse it was to push a boulder up a steep hill, only to have the giant who guarded the hill roll hte boulder down again–and so on, forever, throughout eternity; he was still out there, that hapless man, somewhere at the other end of the earth, pushing his boulder up the hill. He had John’s entire sympathy, for the longest and hardest part of his Saturday mornings was his voyage with the broom across this endless rug; and, coming to the French doors that ended the living room and stopped the rug, he felt like an indescribably weary traveler who sees his home at last. Yet, for each dustpan he so laboriously filled at the doorsill demons added to the rug twenty more; he saw in the expanse behind him the dust that he had raised settling again into the carpet; and he gritted his teeth, already on edge because of the dust that filled his mouth, and nearly wept to think that so much labor brought so little reward. Well, as I scrubbed the bathroom I thought about how I’ve written about dust demons, and I’ve written about cleaning and Sisyphus! And I thought how foolish it is to feel good about having written about the same things in the same way as James Baldwin, how foolish it is to compare myself to James Baldwin at all, except that he makes everything feel so human and at once so specific and so universal that everybody reading him must find revelatory similarities and sympathies. I started reading Baldwin, at this time, because I’m writing a novel (insert laugh-track hilarity here.) And I always believe that if you read well, you’ll write well. I was hoping that some of Baldwin’s fierceness and honesty and fearlessness and poetry would rub off on me. And I happen to be writing about a person who cleans (yes it is going to be as interesting as that sounds!) It’s funny how sometimes something well-done can be inspiring, but if it’s so well-done it might make you think, “Why bother? Give it up, kid!” But I suppose, as in all things, there’s a balance. And for now I’m just grateful that Baldwin made it to the end of the rug and left the room, and found time to write this haunting and beautiful novel, to give this hapless woman something to think about on a dreary January day. I love food you can eat with your fingers and dip in different sauces. I always pretend I make a meal like this for the boys, but it’s really for me. David asked me to make romesco sauce, which I was glad to do. Since romesco sauce is Spanish, I decided to invent tapas to dip in it. I made these croquettes with semolina, artichoke hearts and mozzarella. They’re like little semolina dumplings…soft and dense inside, and crispy and puffy outside. As ever, I used canned artichoke hearts that are packed in brine, but you could use fresh or frozen if you like. I also made oven-roasted fries to dip in the sauce, and I sauteed some kale and spinach with golden raisins, pecans and garlic, which might have been my favorite part of the meal! Here’s Git up, Git Out by Outkast. Cee Lo Green always helps to shake a person out of discouraged despondence. Warm the milk in a medium-sized sauce pan over medium heat. Add the herbs and salt. When the milk starts to bubble, pour the semolina flour in in a thin stream, beating the whole time. When it’s all mixed (it will be quite thick) transfer to a big bowl and let cool for a few minutes. Meanwhile, put the artichoke hearts and mozzarella in a food processor and buzz once or twice, just to chop them up. They should be finely diced, but not pureed. Alternatively, finely dice them by hand. Beat the eggs into the semolina mixture one at a time. Then stir in the artichokes and mozzarella. Chill while you preheat the oven to 425. Generously coat a big baking sheet with olive oil. Form the batter into “finger” shapes, about 3 inches long and half an inch thick. Place them on the sheet, and roll them over so each side gets coated. Bake until they’re puffed and golden brown, turning from time to time so that they brown on all sides. I put mine under a broiler at the end, so they’d get nice and brown and crispy, but keep an eye on them if you do this so you don’t burn them. 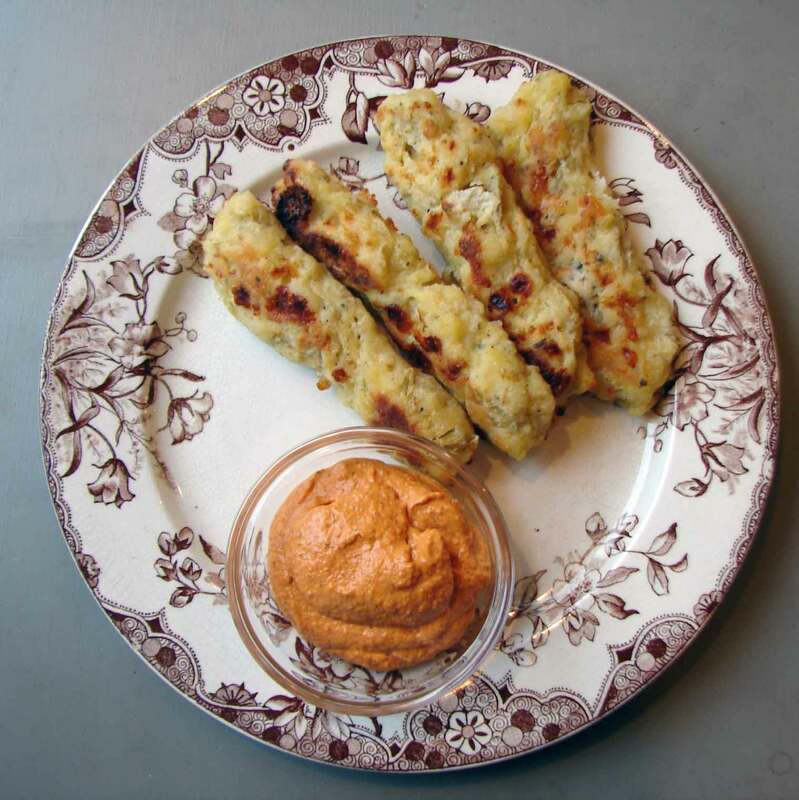 Serve them with romesco sauce to dip them in. 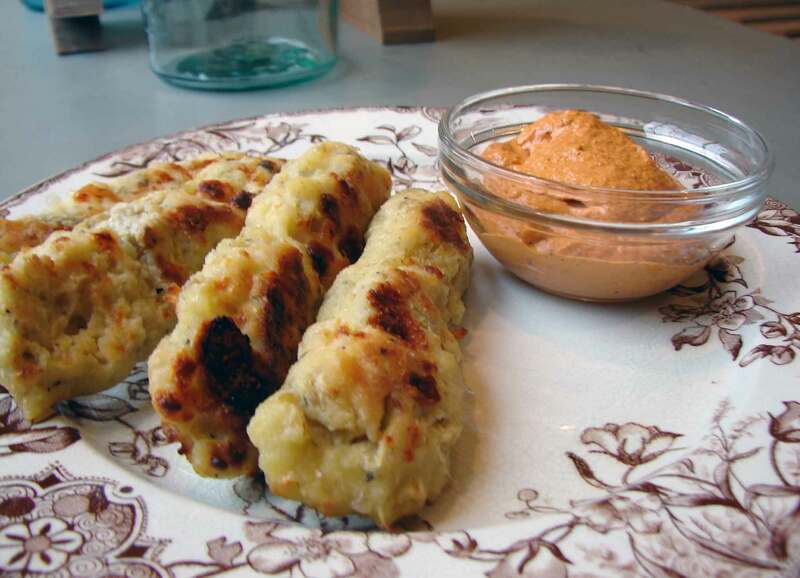 This entry was posted in appetizer, croquettes, recipe, sauce, Uncategorized and tagged artichoke croquettes, dipping food, finger food, romesco sauce, semolina croquettes, tapas by Claire. Bookmark the permalink. Oh, I’m going to make these! I already have the semolina, at least. And I’ll read your book because cleaning is something I have a definite love-hate relationship with. Anyone would, who lives with an elderly long-haired black cat and cream carpets. Most of the time I just don’t care about the state of the carpets but today I got the urge, and I must say they look a whole lot better. Which is sartisfying. Of course, I live alone (apart from the cats) so it’s easier for me. Or it should be. Clio’s fur is like soft grey dust–not immediately noticeable, but everywhere you look. I don’t mind cleaning, either, I just wish I was better at it. It can be satisfying when it actually works. Though as I’m sure you remember, with small boys around it never stays clean for long. I hope the recipe works out for you! Well, it did in a way – but I must have translated the cup measurements wrongly somehow, because the mixture turned out much too runny to be shaped. So I made it as a traybake with grated cheese on top and it was delicious! Mine were quite soft, too. They were messy to form, but it was possible. I bet it would be good as a tray bake, though! I’ve done that with this sort of semolina-choux pastry in the past and it got even puffier than these did. Thanks for trying it out! Best of luck on your novel, Claire! I assume you’ve read the recent NYTimes Op-Ed, “The Case for Filth”? Thanks, and I haven’t read it…I’ll look it up now!